Today is December 21, 2012. It’s the conclusion of b’ak’tun, the last day of the Mesoamerican Long Count calendar. According to Olmec and later Mayan traditions, today marks the last day of Fourth World Age, and thus associated with the apocalypse. But we are still here. As of this post’s writing, the world has not ended. In other news, Gangnam Style just became the first YouTube video to have more than 1,000,000,000 views. At this point Gangnam Style is utterly ingrained in Internet culture. It’s spawned countless memes and parodies. There are now Gangnam Style merchandise, apps and gear. You don’t hit 1 billion views without becoming a thing. PSY’s lack of stance on copyrights has led greatly to the video’s success but it doesn’t bring in the cash. That comes from PSY’s commercial deals, YouTube ads, and iTunes says. The AP reported in early December that PSY is said to make $8.1 million this year alone. Not a bad haul for a video that’s only 6 months old. The video made its YouTube debut on July 15 and surpassed Bieber’s “Baby” video in November– which had a nice run at the top of YouTube’s charts since its debut in February 2010. At least Bieber’s corporate parents won’t be too unhappy about this development: since September, PSY and Bieber work for the same music label. The Olmecs and Mayans weren’t the only ones to forecast the end of the current age of life. 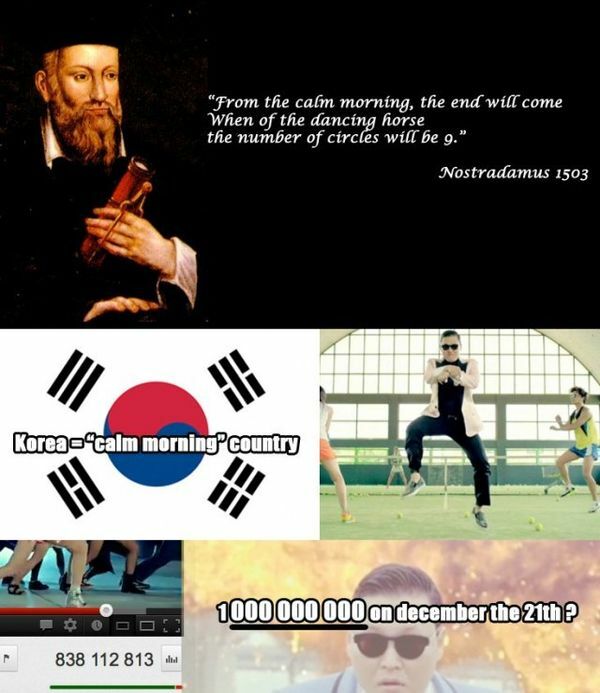 Others, like Nostradamus, were less specific but predicted the world would end once certain conditions were met. Looks like he was wrong, too.